Location: In the middle of the village, side on to the main road, set in a small walled churchyard slightly above the road. Opened February 1877, architect John Prichard of Cardiff. Screen erected by Sir Herbert Cory in gratitude for the safe return of those who fought in the Great War. In mid C19 nearest church was in Whitchurch; from 1850 squire of Greenmeadow Henry Lewis fitted up his coach house as church and school and subsequently gave site and £100 for new building; Melingriffith works and Llandaff Church Extension Society also contributed; foundation stone laid 1875. Records specify roof was ' to be of Penmoyle tiles ..and chancel will be floored with tiles from works of Messrs Godwin of Lugwardine.' Church was Chapel of Ease to St Mary's Whitchurch until 1921. Road widening 1950 reduced width of churchyard. Small Gothic Revival parish church in early Decorated style. Built of coursed and snecked tooled grey and red sandstone with pale ashlar dressings; Welsh slate roof with corbel table and cruciform finials. Plan of nave with W bellcote, S porch, lower narrower chancel, large NE vestry with and later hall wing. W window is large, of 4 lights with Geometric roundel tracery and face stops to roll-moulded hood. Bellcote of ashlar has steeply pitched gabled hood over a double-arched opening with only one bell. S nave has three 2-light windows with trefoil tracery and roll moulding. Porch has steep-pitched gabled roof, battered walls and moulded doorway. Chancel has E window of 3 lights with Geometric tracery and small SE window of paired lights in a square-headed surround. N nave has buttress with offsets to eaves level and similar window; vestry with single pitched roof has simple paired lights and shouldered doorway at E.
Interior is rendered with some exposed ashlar dressings. Barrel roof with moulded ridge beam and boarded ceiling. Unusual N doorway with blind arches and trefoil. War Memorial to men of Tongwynlais on N wall; very plain cylindrical pulpit and font. Wide moulded pointed chancel arch with gilded capitals and head stops; finely carved chancel screen in Perpendicular style. Plain panelled chancel, sanctuary and choir stalls; boarded ceiling of 4 bays with painted ribs and pendant metal cross; panelled altar and reredos incorporating shields; wrought iron altar rails. 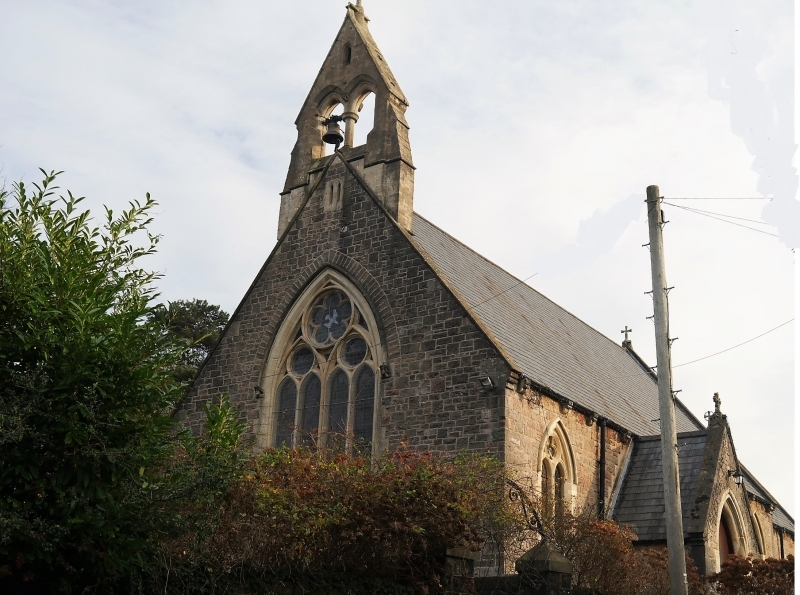 Included as a small church by an important ecclesiastical architect in South Wales and in a prominent village position. Near the centre of the village SW of the main village thoroughfare, set in walled yard with 3 iron gates, railings with spear finials and 5 piers.